Evan Twomey is currently a postdoctoral researcher at PUCRS (Porto Alegre, Brazil) and the VUB (Brussels) studying color evolution in Ranitomeya. 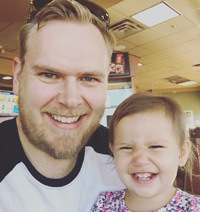 Originally from Maine, he did his undergraduate degree in zoology at the University of Maine, and then enrolled in the masters program at East Carolina University to study under Dr. Kyle Summers. His masters thesis work dealt with species distribution ecology, habitat selection, and biogeography in the genus Ameerega. Evan then did a PhD with Kyle Summers, focusing on mate choice, population genetics, and color divergence in the context of mimicry and speciation in Ranitomeya imitator. 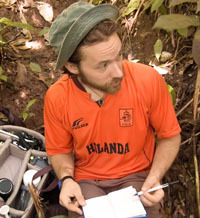 He has also worked closely with Jason Brown on the taxonomy and systematics of Peruvian poison frogs. Jason Brown is originally from South Dakota. Trained in molecular techniques as an undergraduate, he applied these methods in his dissertation research on the evolution of parental care in the genus Ranitomeya. 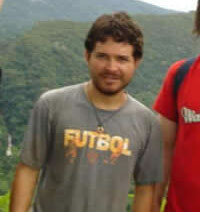 Jason has spent considerable time in Costa Rica, Venezuela, and Peru over the past 4 years. In addition to his doctoral research, he and Evan have mounted several expeditions to remote areas of Peru which have documented numerous undescribed species of poison frogs. In 2009, Jason finished his PhD under Kyle Summers at ECU. He then worked as a postdoc in Anne Yoder’s lab at Duke. He has published papers in phylogenetics, biogeography, and behavioral ecology in some of the most respected journals of the field. Currently, Jason is a professor at Southeastern Illinois University. Justin Yeager is originally from Pennsylvania. He graduated from the University of Delaware with a degree in Wildlife Conservation. He did his masters work under Dr. Kyle Summers, focusing on mate selection behavior in dendrobatids. He then did a PhD at Tulane with Corrine Richards. He has spent a great deal of time traveling South America, most recently living in Peru. Justin is currently a postdoctoral researcher working on lizard genetics. Mark Pepper is a Canadian conservationist working out of Iquitos, Peru. Together with his colleague Manuel Sanchez, the two have designed and implemented a project for the conservation of poison frogs through habitat purchase and protection. By selling captive-bred Peruvian frogs, Mark is able to generate money which is used for the purchase of critical areas for conservation. To date, Mark and Manuel own and protect several plots of land near Iquitos, Tarapoto, and Yurimaguas. Mark is also the most active in the field of all the Dendrobaters. Since 2004, he has traveled extensively and almost without rest throughout most of north and central Peru, documenting several new morphs of A. bassleri, R. lamasi, and R. fantastica. Manuel Sanchez is a Peruvian conservationist working out of Iquitos, Peru. Together with Mark Pepper, Manuel has helped protect several areas of critical poison frog habitat, and is currently working on obtaining a substantial land concession for conservation purposes. Manuel travels constantly throughout Peru and has played a central role in numerous expeditions. 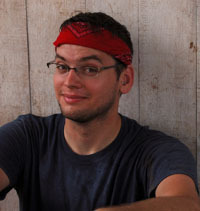 Erik Melander is a Canadian dart frog hobbyist working out of Toronto, Ontario and is the lead administrator and developer for dendrobates.org. 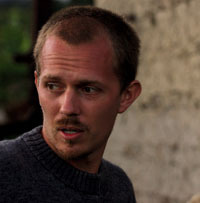 Erik is also the lead administrator for canadart.org, Canada’s largest dart frog community.